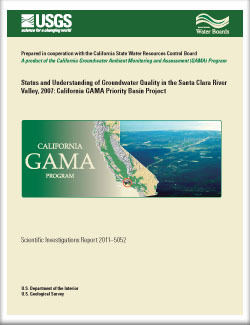 Groundwater quality in the approximately 460-square-mile Santa Clara River Valley study unit was investigated from April through June 2007 as part of the Priority Basin Project of the Groundwater Ambient Monitoring and Assessment (GAMA) Program. The GAMA Priority Basin Project is conducted by the U.S. Geological Survey (USGS) in collaboration with the California State Water Resources Control Board and the Lawrence Livermore National Laboratory. The Santa Clara River Valley study unit contains eight groundwater basins located in Ventura and Los Angeles Counties and is within the Transverse and Selected Peninsular Ranges hydrogeologic province. The Santa Clara River Valley study unit was designed to provide a spatially unbiased assessment of the quality of untreated (raw) groundwater in the primary aquifer system. The assessment is based on water-quality and ancillary data collected in 2007 by the USGS from 42 wells on a spatially distributed grid, and on water-quality data from the California Department of Public Health (CDPH) database. The primary aquifer system was defined as that part of the aquifer system corresponding to the perforation intervals of wells listed in the CDPH database for the Santa Clara River Valley study unit. The quality of groundwater in the primary aquifer system may differ from that in shallow or deep water-bearing zones; for example, shallow groundwater may be more vulnerable to surficial contamination. Eleven additional wells were sampled by the USGS to improve understanding of factors affecting water quality. The status assessment of the quality of the groundwater used data from samples analyzed for anthropogenic constituents, such as volatile organic compounds (VOCs) and pesticides, as well as naturally occurring inorganic constituents, such as major ions and trace elements. The status assessment is intended to characterize the quality of untreated groundwater resources in the primary aquifers of the Santa Clara River Valley study unit, not the quality of treated drinking water delivered to consumers. Relative-concentrations (sample concentration divided by health- or aesthetic-based benchmark concentration) were used for evaluating groundwater quality for those constituents that have Federal and (or) California benchmarks. A relative-concentration greater than 1.0 indicates a concentration greater than a benchmark. For organic and special interest constituents, relative-concentrations were classified as high (greater than 1.0); moderate (greater than 0.1 and less than or equal to 1.0); and low (less than or equal to 0.1). For inorganic constituents, relative-concentrations were classified as high (greater than 1.0); moderate (greater than 0.5 and less than or equal to 1.0); and low (less than or equal to 0.5). Aquifer-scale proportion was used as the primary metric in the status assessment for evaluating regional-scale groundwater quality. High aquifer-scale proportion is defined as the areal percentage of the primary aquifer system with relative-concentrations greater than 1.0. Moderate and low aquifer-scale proportions are defined as the areal percentage of the primary aquifer system with moderate and low relative-concentrations, respectively. Two statistical approaches, grid-based and spatially weighted, were used to evaluate aquifer-scale proportions for individual constituents and classes of constituents. Grid-based and spatially weighted estimates were comparable in the Santa Clara River Valley study unit (within 90 percent confidence intervals). The status assessment showed that inorganic constituents were more prevalent and relative-concentrations were higher than for organic constituents. For inorganic constituents with human-health benchmarks, relative-concentrations (of one or more constituents) were high in 21 percent of the primary aquifer system areally, moderate in 30 percent, and low or not detected in 49 percent. Inorganic constituents with human-health benchmarks with high aquifer-scale proportions were nitrate (15 percent of the primary aquifer system), gross alpha radioactivity (14 percent), vanadium (3.4 percent), boron (3.2 percent), and arsenic (2.3 percent). For inorganic constituents with aesthetic benchmarks, relative-concentrations (of one or more constituents) were high in 54 percent of the primary aquifer system, moderate in 41 percent, and low or not detected in 4 percent. The inorganic constituents with aesthetic benchmarks with high aquifer-scale proportions were total dissolved solids (35 percent), sulfate (22 percent), manganese (38 percent), and iron (22 percent). In contrast, the results of the status assessment for organic constituents with human-health benchmarks showed that relative-concentrations were high in 0 percent (not detected above benchmarks) of the primary aquifer system, moderate in 2.4 percent, and low or not detected in 97 percent. Relative-concentrations of the special interest constituent, perchlorate, were moderate in 12 percent of the primary aquifer system and low or not detected in 88 percent. Relative-concentrations of two VOCs—carbon tetrachloride and trichloroethene (TCE)—were moderate in 2.4 percent of the primary aquifer system. One VOC—chloroform (water disinfection byproduct)—was detected in more than 10 percent of the primary aquifer system but at low relative-concentrations. Of the 88 VOCs and gasoline oxygenates analyzed, 71 were not detected. Pesticides were low or not detected in 100 percent of the primary aquifer system. Of the 118 pesticides and pesticide degradates analyzed, 13 were detected and 5 of those had human-health benchmarks. Two of these five pesticides—simazine and atrazine—were detected in more than 10 percent of the primary aquifer system. The second component of this study, the understanding assessment, was to identify the natural and human factors that affect groundwater quality on the basis of the evaluation of land use, physical characteristics of the wells, and geochemical conditions of the aquifer. Results from these analyses are used to explain the occurrence and distribution of selected constituents in the primary aquifer system of the Santa Clara River Valley study unit. The understanding assessment indicated that water quality varied spatially primarily in relation to depth, groundwater age, reduction-oxidation conditions, pH, and location in the regional groundwater flow system. High and moderate relative-concentrations of nitrate and low relative-concentrations of pesticides were correlated with shallow depths to top-of-perforation, and with high dissolved oxygen. Groundwater of modern and mixed ages had higher nitrate than pre-modern-age groundwater. Decreases in concentrations of total dissolved solids (TDS) and sulfate were correlated with increases in pH. This relationship probably indicates relations of these constituents with increasing depth across most of the Santa Clara River Valley study unit. Previous studies have indicated multiple sources of high concentrations of TDS and sulfate and multiple geochemical processes affecting these constituents in the Santa Clara River Valley study unit. Manganese and iron concentrations were highest in pre-modern-age groundwater at depth and in the downgradient area of the Santa Clara River Valley study unit (closest to the coastline), indicating the prevalence of reducing groundwater conditions in these aquifer zones. Burton, C.A., Montrella, Joseph, Landon, M.K., and Belitz, Kenneth, 2011, Status and understanding of groundwater quality in the Santa Clara River Valley, 2007—California GAMA Priority Basin Project: U.S. Geological Survey Scientific Investigations Report 2011–5052, 86 p.